Generation of electricity from solar photovoltaic (PV) energy exhibits the fastest growth. Starting from a small base, PV accounts for 17 percent of total electricity generated from renewable energy sources, excluding hydro power, in 2040, According to the latest Annual Energy Outlook 2013 (AEO 2013) report released by the U.S. Energy Energy Information Administration. Also the Report gives us the fact, the share of generation from renewables will grow from 13 percent in 2011 to 16 percent in 2040. But the New Report is less Optimistic about avanced Biofuels compared to the Previous editions of the Report, as lack of ability of advanced biofuels to capture a rapidly growing share of the liquid fuels market. Relatively low natural gas prices, facilitated by growing shale gas production, spur increased use in the industrial and electric power sectors, particularly over the next 15 years. 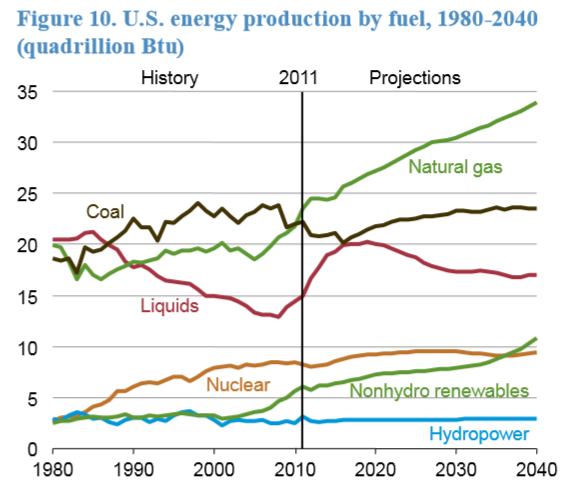 Natural gas use (excluding lease and plant fuel) in the industrial sector increases by 16 percent, from 6.8 trillion cubic feet per year in 2011 to 7.8 trillion cubic feet per year in 2025. While Coal production will be growing in most years after 2016, coal consumption in the power sector and for the production of coal-based synthetic liquids increases more slowly due to the more production of Non Hydro Renewables like Solar and Wind Solar and Wind. Also State RPS requirements and abundant low-cost natural gas help shift the fuel mix for electricity generation away from coal and reduce emissions in both the residential and commercial sectors. AEO2013 report indicates that, the Domestic production of crude oil will increase sharply, with annual growth averaging 234 thousand barrels per day (bpd) through 2019, when production reaches 7.5 million bpd. 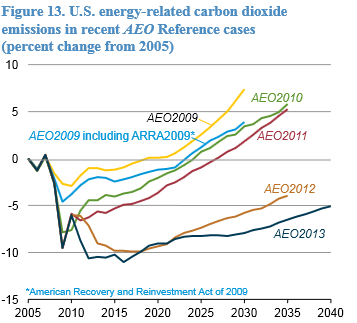 Total U.S. energy-related CO2 emissions do not return to their 2005 level (5,997 million metric tons) by the end of the AEO2013 projection period. Growth in demand for transportation fuels is moderated by rising fuel prices and new, stricter federal CAFE standards for model years 2017 to 2025, which reduce transportation emissions from 2018 until they begin to rise near the end of the projection period. 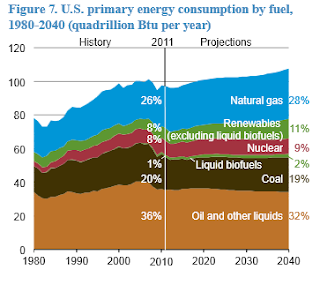 Transportation emissions in 2040 are 26 million metric tons below the 2011 level. Largely as a result of the inclusion of the new CAFE standards in AEO2013, transportation-related CO2 emissions in 2035 are 94 million metric tons below their level in the AEO2012 Reference case. Download the AEO Report here.